My local CSA had fresh rosemary this week and I couldn’t wait to use some in another smoothie, and smell its beautiful aroma :) My first rosemary smoothie was a huge success and oh so delicious! I’ve been using rosemary more and more in the kitchen and felt somewhat validated last week while listening to an interview with esteemed herbalist Susun Weed. She mentioned many of rosemary’s wonderful qualities, in particular its antioxidant potency. I actually dug up this article by Susan for those interested in her take – Now Remember Rosemary. Consider rosemary one of my favorite herbs! I’ve been using fresh rosemary, but have some drying out as I type this for use in future smoothies and culinary adventures. Rosemary is like most herbs, you can add it to just about any smoothie. Play around with it. This smoothie is a bit smaller than normal and more of a snack than a meal replacement. Although you can beef it up with a banana, additional greens, and whatever else you have on hand. Enjoy! I’d love to know if you tried this raspberry rosemary smoothie – please do tell in the comments below. Happy Blending! 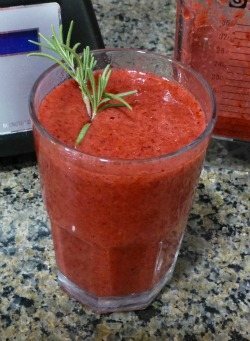 I made the raspberry rosemary smoothie and loved it! I added some Fage and some splenda. I will be making this again very soon!